The thermally activated slab system for heating and cooling of the YWCA Toronto’s Elm Centre through radiant technology is the first of its kind to be installed in North America. Last year, YWCA Toronto opened the doors of its Elm Centre, an affordable housing complex for women and their families incorporating various energy-efficient elements into its design. The $80-million project was designed by Hilditch Architects and spans across a city block in Toronto’s downtown core. It includes five-, 10-, and 17-storey residential towers, commercial space, and YWCA Toronto corporate offices. Energy Star-rated appliances in the 302 residential units. Notably, a multi-stage heat recovery system and geothermal heat-pump system, combined with a thermally activated slab radiant heating and cooling system, was also installed in the building complex. This inclusion will reduce annual carbon emissions by 45 per cent, as compared to a conventional system. The radiant system was installed as the primary heating and cooling source for the three residential towers, as it could be integrated with the geothermal system in the complex. 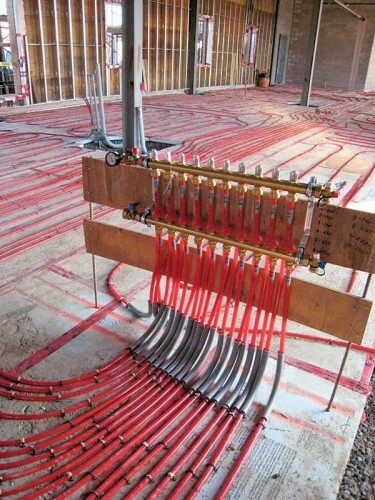 “We realized specifying a radiant system for this particular project, which was centrally focused around a large-scale geothermal energy source, would further enhance the overall efficiency of the HVAC system,” says Alex Tan, P.Eng., of Lam & Associates, the building’s mechanical and electrical engineering firm. minimized circulation of airborne allergens. The radiant heating and cooling system installed in the Elm Centre covers a total of 20,000 m2 (212,000 sf) throughout each level of the three residential towers; it required 72,000 m (236,000 ft) of piping. Each residential suite is also equipped with the ability to individually control the temperature with thermostats integrated with the building automation system (BAS). Residents began occupying the Elm Centre in 2011, and are now a part of the largest affordable housing complex to be built in Toronto in the last decade.